With this season being what it is in terms of hectic days and endless "To Do" lists, I never thought I'd be motivated to complete a Christmas post this year. However, I absolutely had to take a deep breath and take the time to share a table with you. But, more importantly, I felt I had to send a huge "THANK YOU", to my newfound friends in the blogging world who have taken the time to send healing wishes and words of encouragement since my last post when I explained the heart procedure I had to go through, coupled with its slow recovery during a most inopportune season! I have treasured everyone's messages and cannot express my gratitude deeply enough to each of you. I am stronger every day and you are partly responsible for my improvement! The "Christmas Wishes" part of this post is to wish you and your families a wonderful blessed Christmas with a New Year full of happiness and good health. 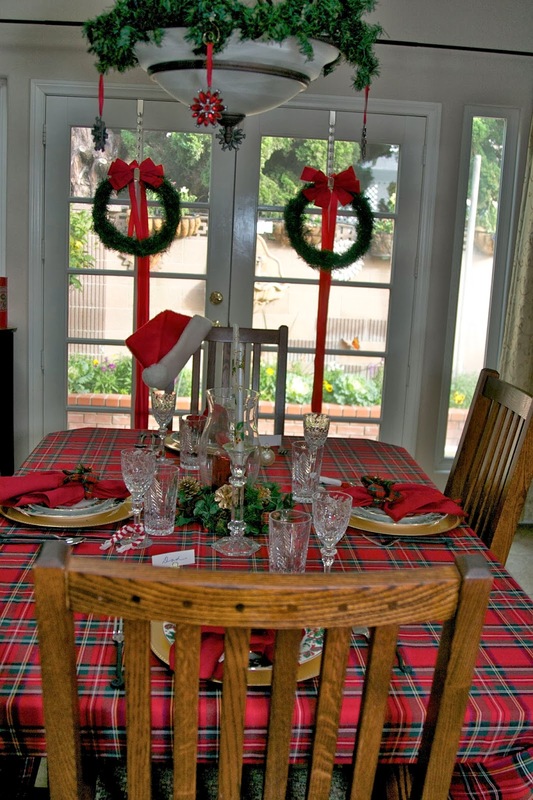 A Christmas table for four. 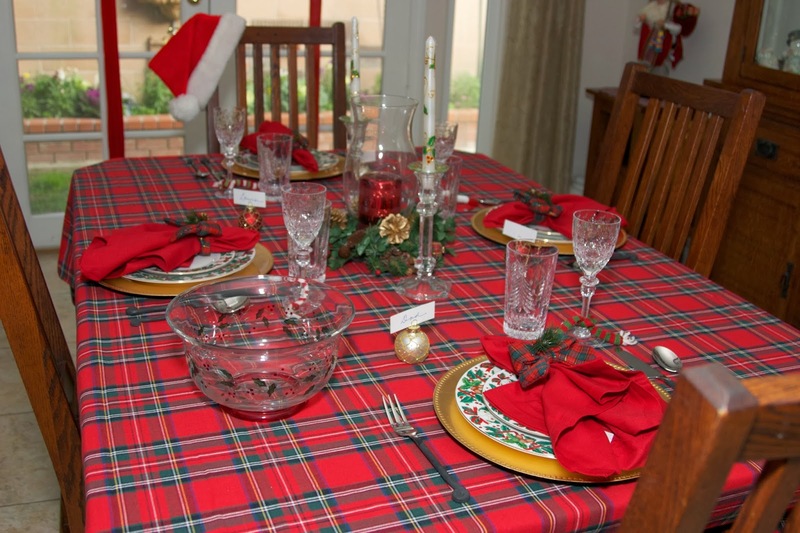 I started with a new plaid tablecloth from Home Goods. I usually use a dark green Damask tablecloth, but I have been wanting to "change up" my Christmas look and a new tablecloth seemed like the easiest way to do this. I then added my gold chargers from Big Lots. Next came the dinner plate from my Christmas dish set I bought at the Best Product store 23 years ago! 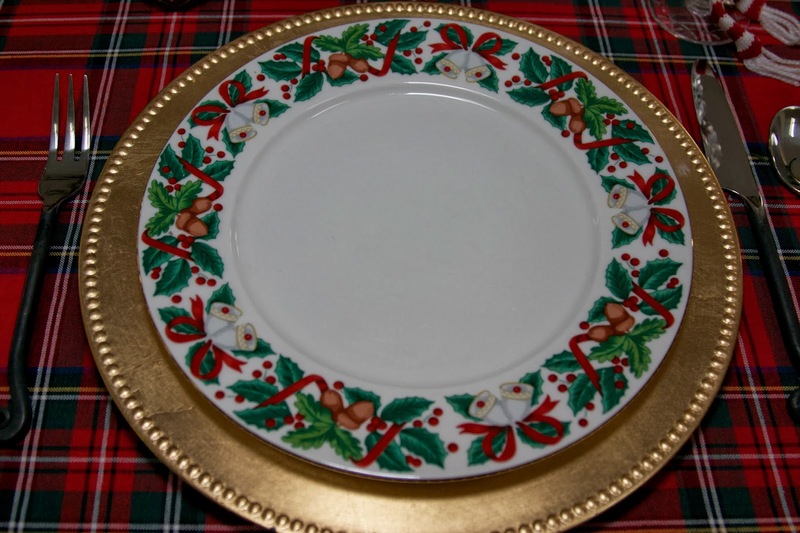 It is labeled Royal Magestic Fine China, Holiday Cheer. I liked the pattern and thought that since there were acorns on it, I could use it for the holiday season when Thanksgiving started, but have yet to do that since buying my Johnson Bros. Friendly Village plates! I added the salad plate from the set. There are also cups and saucers, a platter, one serving bowl, and a tea set that consists of a teapot and a sugar bowl and creamer. This is the table setting. I used my "Treble Clef" flatware from World Market because I didn't want to use my silver flatware since the dishes are banded in gold. 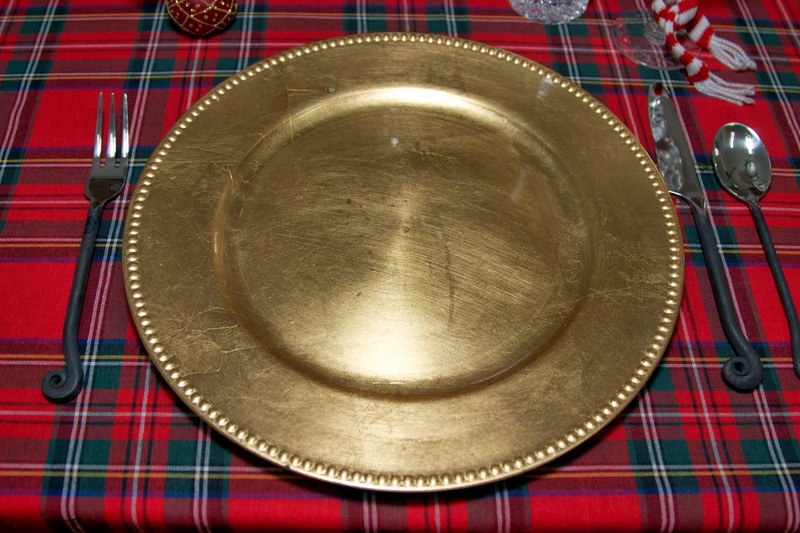 I have a request in for gold flatware, but I'm not sure it made Santa's list! My stemware and water glasses are both by Mikasa. I wish their outlet store were still open! It used to be such a treat to go through that store and drool along the way! My red napkins are from World Market and my plaid napkin rings came from the May Co. many years ago. The placecard holders were bought at Williams-Sonoma, I believe. I kept my centerpiece simple. My hurricane lamp is surrounded by one of the Christmas candle wreaths that actually adorned our reception tables at our wedding 25 years ago. Getting married in December made decorating for the event easy! It also means that whenever we go away for an anniversary weekend, hotels and towns are festooned in their finest! There are lit trees and garlands everywhere and we feel like everyone is celebrating with us! I wanted to share this take on "wine charms" for the holidays. I got these little "wine scarves" from a fundraiser offered at a local elementary school. There are 6 different pattern of "scarves" and they add some whimsy to the table! I'll be joining Susan at www.betweennapsontheporch.net and Kathleen at www.cuisinekathleen.com. Plaid makes a very festive and pretty holiday table. 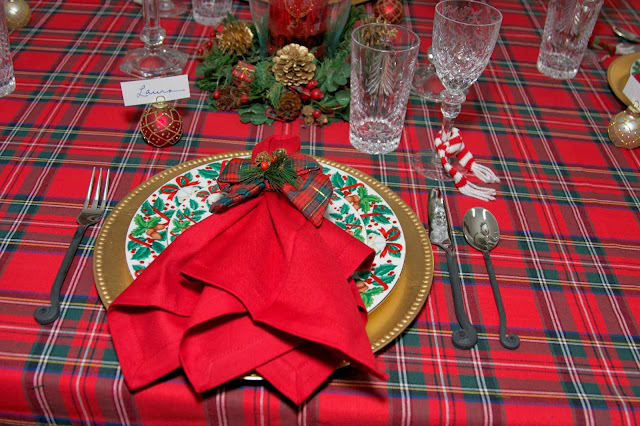 The May Co. napkin rings and the Christmas red tablecloth compliment the tablecloth beautifully. 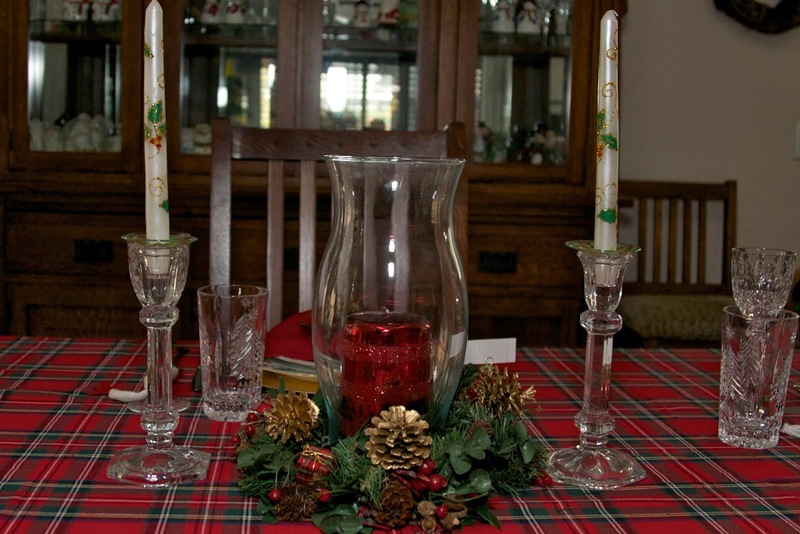 I love the Christmas tree glasses and the stemware. Beautiful tablescape! 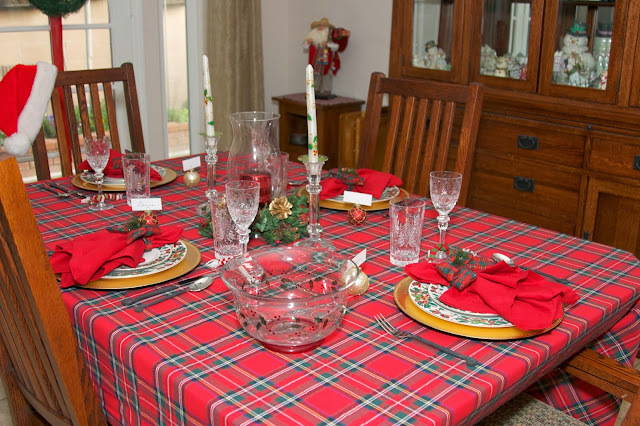 Great tablescape for Christmas. 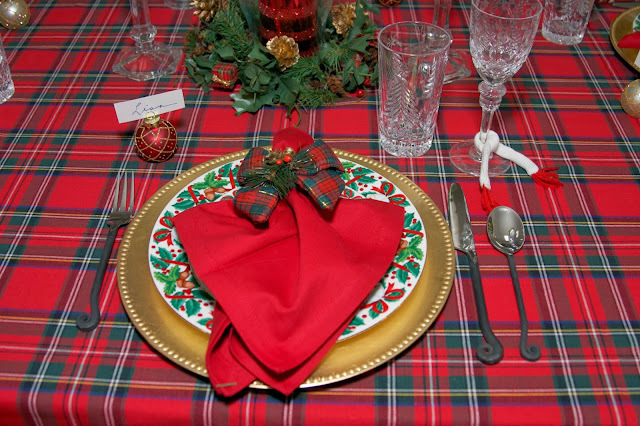 Love the tartan tablecloth, napkin rings and wine scarves...so cute. Wishing you Happy Anniversary and a Merry Christmas! Rosie - we were definitely thinking alike this week. I used the Royal Stewart plaid on my table, too. I love it, don't you?? 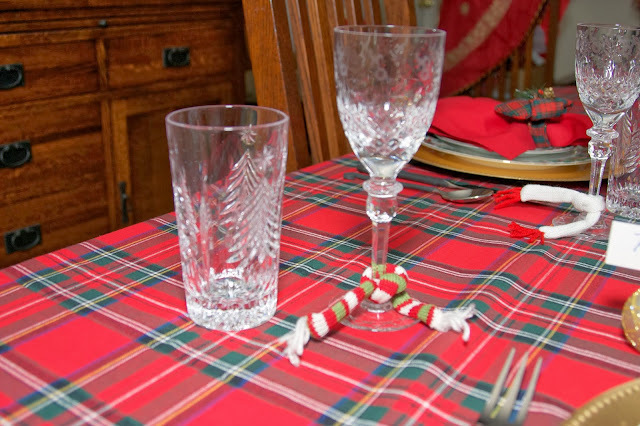 However, my very favorite things on the table are those adorable miniature scarves that you tied around the stemware. Oh, how cute is that!!! Hope you have a glorious Christmas! Beautiful tablescape. 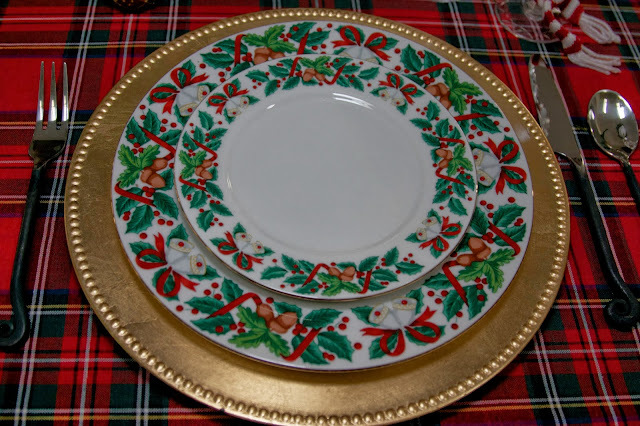 Your Christmas dishes are the prettiest I've seen and I like how you used the ornaments as name place holders. Thanks for stopping by my blog and leaving me your sweet comment. Your table is just wonderful! I love your plaid tablecloth. I need one! ;) Your dishes are very pretty and I love your glasses. Your centerpiece looks so pretty too. I'm sorry to hear you've had the surgery but prayerfully you're getting better each day. Thank you so much for popping in to see me and I hope you'll come back some time. This is very cute! I love the plaid, and I like the way your dishes look with it. 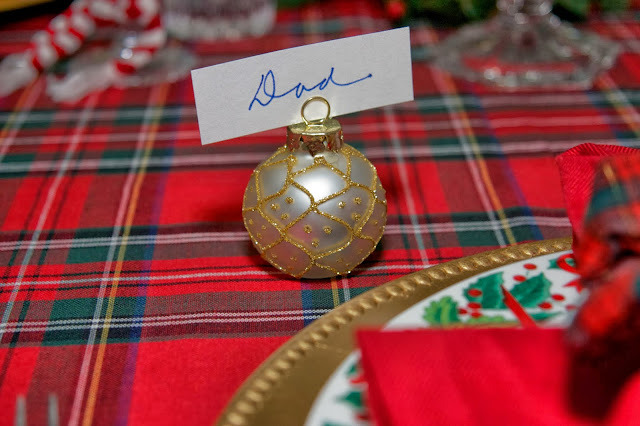 Love those cute ornament place card holders, too. Very beautiful! I really like your dishes...lovely. I love your festive table with all its cheery details! Plaid is a fave of mine! Those little wine scarves are adorable! Merry Christmas and thanks for linking at Let's Dish! Plaid is perfect for Christmas! Well, it's perfect anytime, really, but at Christmas it seems to go with most Christmas decorations. Your table is lovely!